The LTO tape technology behind an LTO tape is the ability to keep it's shape whilst moving at high-speed across the recording heads it also needs to be smooth as any abrasives in the tape will quickly wear out the tape head. When stored data is read by the drive heads, the tape and the head contact harshly, causing wear and creating static electricity. Sony’s design philosophy is to alleviate such phenomenon to provide stable media performance even after many tape read/write cycles. Sony has developed a technology that allows the electrical resistance and the surface roughness of tape to be designed to the optimum values for the system. This dramatically reduces damage to the head by the tape that holds your data and allows stable writing and reading continuously. Sony storage tapes can run an extraordinary distance; much greater than the distance you will walk during your lifetime. Such distances can greatly wear drive heads. 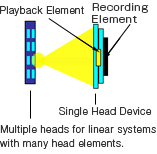 Sony tapes are designed to minimize wear to your drive head because of their superb surface characteristics. Imagine the contact between the drive head and tape is like the contact between your shoes and the road. The rougher the roads you traverse, the greater the wear on your shoes and the more quickly you’ll need a new pair. The same applies to the head and the tape. That’s why Sony designed our tape with an extremely smooth surface – so smooth that the unevenness is measured in tens of nanometres (one nanometre is one-millionth of a millimetre). This smoothness prevents the tape from destroying the head, even after prolonged contact. Sony is pursuing this research even further. 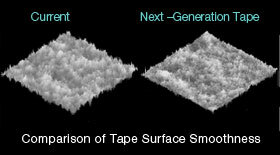 Our latest technology can make the surface of the tape even smoother than the current tape. The interweaving of Sony technology is creating the Silk Road into the future. With linear storage tapes, the head reads the data by passing over the numerous data tracks on the tape in which the data is stored. If the data tracks were wide enough, the head could easily pass over the tracks without guidance. However, in high-density storage formats, the track width is extremely narrow so the only way to keep the head oriented on the data tracks is to carefully guide its position. In the case of data storage, a pre-recorded servo signal is used to guide the head along a track range called the servo tracks. Since these tracks serve as the standard for guiding the head, they are just like train tracks. For a train to run safely, the rails must be laid equally spaced throughout the track length. Sony’s unique servo writer enables the error of spacing to be extremely small. So even when tapes deform because of environmental factors such as temperature and humidity, the servo tracks remain safely uniform. With the linear type magnetic writing and reading format, the path width for the passing reading head is usually narrower than the width of the recorded data pattern (data track width). Unfortunately, tape deformation can cause expansion and contraction of the data track width and the gap between the servo tracks, preventing the reading head from passing over all data tracks. This is called the “off track” condition and it can result in important data not being read. Sony uses a base film with enhanced rigidity for its storage tapes and controls the tapes to contract or expand properly. This allows elimination of reading errors, realizing reliable recording and playback characteristics. If the servo signal bandwidth was 1400 mm, the same width as a train track, Sony minimizes the variation in track width from temperature-humidity differences to only 2 mm. In fact, we now have the technology to reduce distortion: tens of nanometres (one nanometre is one-millionth of a millimetre) to one-half. This precise control is now being applied to Sony storage tapes.